Guys – October is nearly through. But how? How did a whole month fly by and I barely felt it? I have to admit, I’m thoroughly ashamed at my lack of festivity for Halloween. Usually, I’m an obnoxious holiday participant and I can barely contain my enthusiasm, but this year life has been so busy! I actually felt my inner child suffocate a little! As of right now – the only real plans I have are to eat a whole bunch of terrible candy and hope for eager, adorable trick-or-treaters to knock on my door. Also – if you’re looking for a good horror movie to scare yourself shitless with – check out The Conjuring 2. I recently just watched it and nearly dissolved into a puddle of whimpering terror. I say this as a horror connoisseur – James Wan produced another horror masterpiece. It is a well-deserving sequel to the first, dark part of the Conjuring saga. Soon, it will be November! NOVEMBER. I’m slightly panicking. My sister called me the other day and said she had already finished her Christmas shopping. FINISHED?! I barely have next week planned out, let alone presents for Christmas! I’m still getting ready to be excited for Thanksgiving! What is happening in the world!?!? For real though – I am looking forward to Thanksgiving, A.K.A., the most epic meal of the year! This will also be my first year not eating turkey! WHAAAT?! It will be delicious regardless, I’m sure. I’m interested to see what sort of awesome sides I can come up with this year. Thanksgiving is always fun for me because I’m a big traditionalist. I love my green bean casserole, sweet potato casserole, and pecan pie!. My parents, however, are of that weird breed of people that don’t like any of the typical Thanksgiving food. They like stuff like steak, shrimp, eggrolls, and seafood pasta. As much as this is all good food, my eyes roll so hard every year that my father suggests it. It’s blasphemy. Thanksgiving blasphemy. Anywho – here’s what I’ve been eating recently! 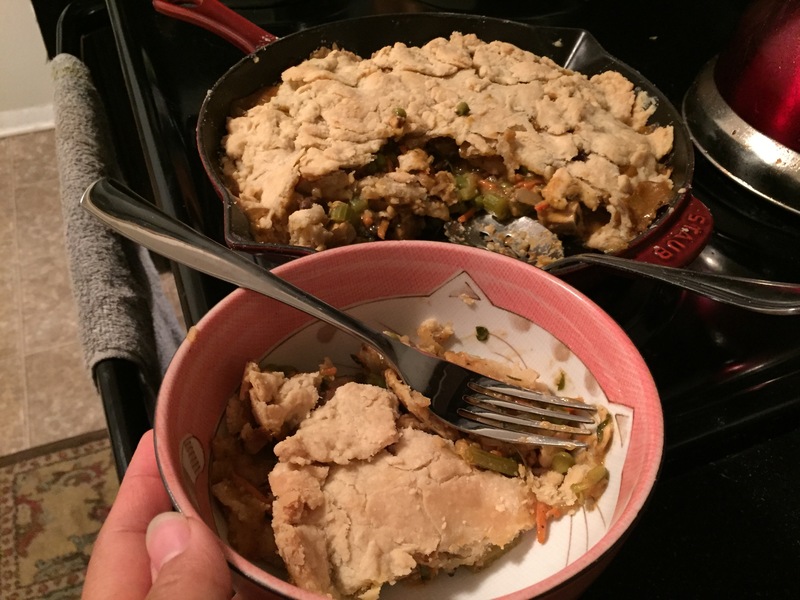 I made the most wonderful, completely vegan, ‘chicken’ pot pie! I filled it with Beyond Meat’s grilled ‘chicken’ strips, celery, carrots, peas, gravy, and mushrooms. It was everything I wanted and more. Also – like my cat bowl?! This is my first time trying anything with Acai. I drink this juice straight or add it to my smoothies. It’s pretty delicious! It tastes something like a grape crossed with a blueberry and a strawberry. I had gone through a rough day when I decided to treat myself to some Whole Foods takeout! Something about having options that don’t make me feel awful and trigger my IBS just instantly makes me feeling better. Paying $8 and up every time…not so much. BUT! It was all delicious. There is sesame tofu, chana masala, veggie biriyani, sauteed zucchini and onions, roasted potatoes and peppers, lemony orzo, and the best thing in there was the balsamic red cabbage. IT WAS AMAZING. I could have eaten just that for my meal. It wasn’t too harsh with the vinegar. I gobbled all of this up happily. I made a smoothie with acai juice, a frozen banana, frozen strawberries, a handful of greens and a bit of water. It was kind of amazing. Vegan pancakes! Topped with a homemade banana’s foster sauce and frozen blueberries. Yes, I did include liquor in my breakfast. And yes, I can never get a decent picture without a dog somewhere in it. I honestly had this spread for breakfast recently. I just wasn’t in the mood for my normal cereal or oatmeal so I ate a bajillion cheese and crackers. I was still hungry after but my craving was satisfied!